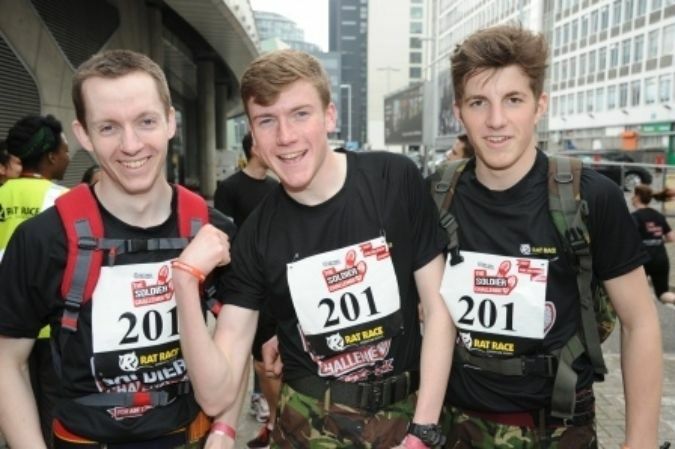 After 5 months of gruelling preparation 2Lt Matt Taylor, Cadet CSgt Daniel Shaw and Cadet Sgt Michael Lynn, The Three Amigos from Carnforth Detachment, took part in ABF's Soldier Challenge on Saturday 19th May 2012. Finishing in a respectable time of 3 hours 27 minutes, they were placed 158th out of the 220 teams, which included Regular Army competition. The event, comprising 35 stands across London, aims to challenge those taking part to raise money and push themselves to the limit by running across the capital to gain as many points as possible. All the stands are scored differently and ranged from simple checkpoints outside museums to challenges at iconic locations such as HMS Belfast and The Imperial War Museum. The Three Amigos completed eight challenges, including an 300-foot abseil at the Oval, a bicycle challenge located in the basement of Waterloo railway station, a 007-themed question and answer session by MI5 and a physical training session in Hyde Park. Other challenges included the light-hearted as Cadet Sgt Lyn dressed as a "military" horse ran around the bandstand in Hyde Park, and the more serious military tactical challenges such as a target recognition exercise at a TA Centre on Davies Street, and a target practice exercise following the mega march of 12 miles through London, including a jog down Oxford Street despite the shopping queues at 1pm on a Saturday. Cadet CSgt Daniel Shaw commented that: "The day was simply brilliant and we will be back next year for more!". The team have raised more than £500 for their challenge, and the total is still growing. Thanks to the Tesco store in Carnforth, the team will be bagpacking to raise more funds towards their appeal and have partnered up with the store to raise money for both the ABF and Tesco's charity of the year, Cancer Research UK. Click here to help raise The Three Amigos' fundraising total.